You must have noticed employers consistently saying that they require a team player when hiring employees for their company. A great example of this can be taken by sports team, where many players come together to work and achieve something which is unable to attain by a single player. Each one on a team has a different set of roles according to their strengths and capabilities. Most of the people emphasize the significance of hiring an employee who will work well in a team, together with the other members of the team and put the company’s mission to the lead. Let us learn how one can become a good team player and work well with others. A good team player at work is someone who is highly reliable at all times and not just for some time. One can count on a good team player for getting a job done, keeping their word and meeting the deadlines as well as to provide consistent work quality. They help the team to be on track with excellent performance and organization. They are able to develop positive work team member relationships by follow-through and maintaining harmony. An effective team player communicates his ideas clearly and honestly. They respect the opinions and beliefs of the others on the team. They know that the key to being heard is by clear, constructive and courteous communication. It is expected that a team player gets the asked work done and do their fair share. However a good team player knows the benefits of taking risks and stepping out of their comfort zone to come up with creative ideas. They know taking up more responsibilities and additional efforts will set them apart and take them ahead. A good team player will not just sit aside to watch changes happening. They will adapt to the changing conditions and will often make proactive efforts for bringing in positive modifications. They are flexible and will not ever complain or feel stressed about a situation. They are ready to put their foot in anything that is thrown their way. A good team player understands the importance of good listeners for the team to function efficiently. They willingly listen to the feedbacks of others and take criticisms sportingly. For meaningful results out of communications, they know that listening must come first. As a team, there will be many challenges that they have to face. A good team player is willing to tackle any problem in a solutions oriented method. They do not blame others or overlook problems. They go for open discussions of the problem and develop action plans. Good team players would take the time to generate positive work relationships with the team members and consider it a priority. They display true dedication and passion towards their team. A good team player would give his 110% to the work and would expect the same from the others. If you worry that others may perform less, be less productive and show less commitment, go ahead and set an example for them by showing how hard work and dedication works and pays off. Put efforts in doing your best, every day. With this you will boost the standard and performance of the members around you. The key contribution as a good member to your team is to use your best abilities and talents to help the team achieve its goals and visions. It is impossible for a team to accomplish its mission without your efforts, abilities and development. It is your duty to improve your team’s efforts and by providing strength to your team. It is established that emotions are contagious and everyday you can infect your team with either positive or negative energy. When you spread positive energy you are capable of transmitting it and enhancing the mood, drive and performance of your team. When your team members have positive interactions with each other they turn highly productive. The team members who have fewer interactions become stagnant as well as are unproductive. This means you have to encourage more positive interactions among the team members by praising, motivating and appreciating more. A good team member will always put his team in the forefront. They are known to develop themselves so as to serve the team better. They don’t take credits but never forget to give credits to the others regularly. Your ego must be passive to the team’s mission and purpose. A thriving team is based on strong relationships and a good team member will take the time to bond, communicate and care for the other team members. No matter how talented or smart you are, if you do not bond well with others you fail as a team member. It is crucial for you to take the time to learn about the others, listen to them and display that you care about them. Trust is an integral part of a relationship and without it you cannot build team skills and strong relationships.Trusting their teammates and put their best efforts in gaining their teammates trust is one of the good team member skills and if your teammates cannot trust you, you will fail to be a good team member. Trust can be gained by integrity, transparency and consistency. It is important for each team member to hold each other accountable. They push and challenge each other to do their best. However, to be effective you must have a strong bond with your teammates. When teammates know that you care about them they will let you push them and hold them responsible. A good team member will at all times be humble. They are willing to learn and develop and so they are open to the feedbacks and suggestions of the other team members. They never let ego hinder team’s growth. Even for self improvement being humble is crucial. Organizations need to meet targets and generate revenue. Tasks have to be completed within the given timeframe and must not be delayed. It is not possible for a single brain to handle the entire decision making and to come up with solutions to the problems hindering the completion of the tasks. In a team, all alternatives can be explored; each one has equal contribution in coming up with best solutions and decisions. Tasks can be completed quickly when a team works on it rather than a single person. When members of a team work together they help and support each other as well as share responsibilities, thus they share the workload and pressure. According to each team member’s expertise, they are assigned with certain tasks and responsibilities which make the results much faster and efficient. If a person in team calls in sick, his tasks can be handed over to another member of the team and the work will not suffer. Thus in a team, other members can take charge of the work and can manage the work in the absence of a member, so that the functioning of the team is never impeded. One can notice a constant and healthy competition amongst the team members. Competition is always beneficial for the employees and the organization as all the individuals feel motivated to do better than the other team members. In this way they even contribute to their team and the organization as a whole. When people function in close coordination, they get to know each other better. Teamwork at work reduces the chances of any conflicts between employees and all of the team members strive to support their fellow teammates. The bonding amongst the employees gets boosted due to teamwork skills. Every teammate has a different set of team player qualities. One of the members can always learn from the other team members which would benefit him in the long run. In a team, each member is motivated to fulfill the expectations of the rest of the team. Each member is an excellent critic and can always correct the other when he goes wrong. During crisis, one can always depend on the other. Team members never want to let down their fellow teammates and therefore perform their best to be a factor in the accomplishments of the team. Peer pressure is generally high in teams and so there will be less cases of low morale. Thus good teamwork generates increased accountability amongst the team members. Team members need to depend on each other to get the work completed and so they have to have trust on each other. They need to trust on the capabilities of each member to complete a task and achieve success. When people in a team trust each other they start respecting each other as well as find their joy working as a team. A diverse team creates ability and generates top ideas. They embrace the difference of each team member and count on benefits to succeed as a team. They respect and acknowledge the differences in ideas and opinions and have healthy disputes to function best as a team. A good team will understand the importance of challenges and would not be afraid of it. They will support each member to challenge everything and to develop and be creative. A good team works in cooperation. They merely act as a group of individuals but operate together to perform the work at hand. A good team would never have procrastinators. One single procrastinator will affect the functioning and efficiency of the team work. Thus people do not prefer procrastinators in a team. A person is motivated when he is committed. A good team has members who are highly motivated and have intense drive to complete things in order to bring success for the team. A team shows high commitment when all of the members have shared goals and mission of bringing the best results as a team. A good team always respects the differences, respects each person’s culture, personality, backgrounds and preferences. They care for each other and each one’s feelings and opinions before saying or taking any actions so that all feel respected. A good team is based on the foundation of being respectful to each teammate. At times a work flow depends on a single member of the team and depends how quickly they can perform a task. Perhaps that is a difficult piece of work to be getting finished with. A best team is the one when all its members unite to offer help to that single member when need of assistance is noticed. They never care for the free time they could get, but invest more time working in a team together, to move things forward. This is called team work. Sharing of ideas and resources are required for a team to make things work. A good team will have members who share everything they have openly and are willing to share their ideas without any fear of another team member stealing the credit. All of it again revolves around having trust in the team. Good team members know each other well and beyond just the professional level. Besides work, they like to learn about each other’s lives, families, hobbies, partners, personal goals and much more. 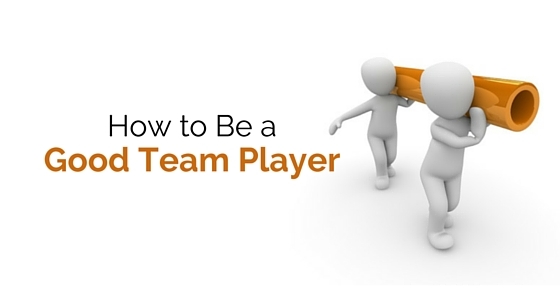 Making efforts to learn more about each team member will help the team to gel well together. A team that is well bonded is capable of achieving anything. A good team cannot be built without good team players. The above tips and points will help you to learn how to be a good team player in order to form a good team. The different aspects help us understand the importance of teamwork and qualities of a good team, all of which is not possible without being a good team player.